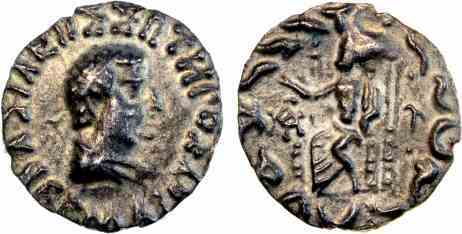 Silver drachm, 16mm, 1.63gm, issued 40-1 BC. Kapisa mint. Obv: BAΣIΛEΩΣ ΣΩTHPOS EPMAIOY, Diademed draped bust right. Rev: Zeus enthroned left, Karosthi legend around. References: Sear 7740, Mitchiner 415f.